Museum shop large prints 20 by 28 in. Free US shipping for orders $60+. 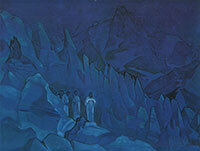 Custom prints may be ordered from Roerich Prints / Oaktree Press. 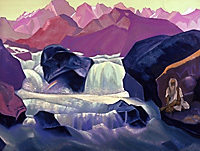 These are of high quality, printed one at a time, with careful color corrections, on a heavy-duty watercolor paper or canvas. For details visit their web site, www.roerichprints.com, write to them at sue.welch5@verizon.net, or call them at 978-975-4400. Many high-quality fine art prints and postcards are available from Agni Publishing House in Samara, Russia, at affordable prices. Visit their website. 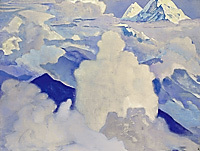 For assistance, please write to us at orders@roerich.org, or call at 1-212-864-7752 during Museum's working hours (Tuesday–Friday: noon–4p.m., Saturday: 2–5p.m.). Shipping is free for USA orders for purchases of $60 and more. We ship by USPS Priority Mail domestically and USPS International Mail. Orders are usually mailed the next business day. • upon checkout choose “Phone order” as the payment method and proceed to place the order online. Then call us at 1-212-864-7752 and provide the name on the card, the number, and the expiration date (or fax them to 1-212-864-7704). You can also pay by sending us the check.